(Phys.org) —As any chef knows, preparing good food is just physics, or was that chemistry? Either way, the state of the art in cooking increasingly looks to science for inspiration. Engineers at MIT have partnered up with culinary collaborators from the industrial world, to bring us two edible enigmas—the self-propelled cocktail boat, and the floral pipet. Their recent paper, just published in the journal Bioinspiration and Biomimetics draws on the natural mechanics of capillary action as perfected in plants, and the ballet of surface tension as virtuously demonstrated by water-walking insects. Many small creatures have found it easier to manipulate the physics of their environment for propulsion rather than haul or launch themselves over it with dedicated appendages. Listeria bacteria, for example, actual seed biopolymers directly inside cells, in effect surfing the cytoskeleton, to get wherever it is they need to go. Slightly larger creatures can use a much simpler mechanism known as Maragoni flow, to move about. Maragoni flow, as seen in the formation of tears in a glass of wine, may result from gradients in temperature or local chemistry along an interface. Insects like the Rove beetle, or the semiaquatic Microvelia, have come up with various means of interfacial propulsion which involve the directed release of a surfactant. This surface-active lipid acts to bias the creature towards the direction of higher tension. The cocktail boat created by the researchers uses the analogous chemically-induced surface tension gradient to move about the glass. The floating boat strategically spills alcohol fuel from its aftward side into its wake, which reduces both tension and liquid contact angle to propel it forward. The cocktail boats were cast from various mixtures ranging from edible candies to semi-edible agar, gelatins, and waxes. The boats were no slouches, with peak speeds of up to 10 cm/sec lasting for up to two minutes. The other edible physics vignette the researchers created was a subtle piece of capillary origami they call the floral pipette. It is intended as a handy way to microtaste droplets of drink. It is reminiscent of a water lilly, which floats at a pond surface, but is anchored at the bottom. When the water rises, the petals are able to wrap up and capture an air pocket which acts to keep the flower's genetic material dry. In the The flower pipet, hydrostatic forces initiate closure as the stem is drawn up, while capillary action acts to channel the liquid. In our heading times of sous-vide and liquid nitrogen prepared desserts, edible ideograms of physical curiosities may represent the next logical step in taste. We may recall Nicololi Tesla, the famous inventor, and curiously—synesthete—who related how he could only enjoy his soup when it had sufficient order for the shapes to whirl about his forearms. While the migration of the experience of taste to a seemingly unrelated tactile or even mathematical sense seems bizarre to many, the intuitions of neuroscience have already begun to give substantial scientific flavor to such a capability. Overlapping topographic maps in the cortex that represent the motile elements of mastication may intrude on those that manipulate the fingers. That is a simple observation, but also hinted at here, is an ethereal continuity of shape, which takes its origin in the bond or resonance of molecular taste and olfaction, and extends in some remnant form, to our macroscopically perceived sense of geometry and motion. We present the results of a recent collaboration between scientists, engineers and chefs. Two particular devices are developed, both inspired by natural phenomena reliant on surface tension. 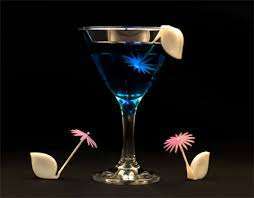 The cocktail boat is a drink accessory, a self-propelled edible boat powered by alcohol-induced surface tension gradients, whose propulsion mechanism is analogous to that employed by a class of water-walking insects. The floral pipette is a novel means of serving small volumes of fluid in an elegant fashion, an example of capillary origami modeled after a class of floating flowers. The biological inspiration and mechanics of these two devices are detailed, along with the process that led to their development and deployment.